How long does that float from Pyatt to Snow usually take you? I've been looking at doing that one for a couple of years, but didn't know how long it would take to do it. I saw a couple of pontoons last year on Crooked Creek rigged with trolling motors (no oars at all). Those guys were just cruising along going wherever they wanted. I had always ruled out the pontoons because of having to deal with oars, but after I saw that it made me think that might be the sweetest way to go. Wow!!! Awesome fish. When can I schedule my trip with you coldwater? Looks like you guys are on the fish big time. Crooked Creek is usually good every year we go up there. I have to make the drive from Russellville at least one time a year. 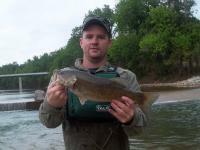 I've only fished from Kelly's Slab to Yellville and would like to fish other stretches just never have. That little stretch brings me and a buddy of mine back every year though. Have had a couple of slow days from year to year, but overall good fishing. No matter where you go, please practive C&R. 8 lb Seaguar Invisx for me lately has been good. I'm one of those fishermen that is prone to buy into new fads though. I do like the lack of stretch and it has less memory than other fluoro I've used. Spiderwire Mono 8 lb. in natural green is a good choice too if you like mono better. A Ton Of Tackle Or A Few Good Lures? I have a Tals chest pack stuffed with various plastics and sometimes an over the shoulder pack filled with various baits just in case nothing is working, but when it gets down to it all I end up throwing are natural colored grubs, finesse worms, tubes, or flukes 99.9% of the time. I would be better off carrying just a few packs of those baits, but I usually can't help myself and overpack. They are generating all weekend and I'm not used to fishing the bigger water. Pretty much have been using powerbait on a drift rig to no avail with the family all weekend. Any suggestions would be appreciated. Thanks guys. How To Tie A Drift Rig? Thanks, that clears it up. Appreciate your help. Hope to get up to your place and visit sometime. Kellys Slab Renovation ~ Fishing Will Heat Up. Been there a couple of times the last couple of weeks. Looks like some of the improvements suffered a little bit of a setback. They had planted many trees on the west side of the bank just upstream of the slab and they took a beating from the flooding a couple of weeks ago. However, all the rock work they have done along the bank looks good and held up well. The fishing was pretty good too. Went on the weekend of the 14th and caught 90 between three of us. Largest being around the 18" range.